This recipe has so many back stories I don't know where to begin. But I do know how it should end -- making this dessert filled with chopped walnuts and raisins and soaked in a lightly sweet lemon syrup for a Seder or other event this Passover. First back story -- when I was in Turkey I saw lots of shredded phyllo (filo) dough pastries and sampled quite a few, all with a sweet syrup and most filled with chopped nuts and or dried fruits. I also had my share of the more familiar baklava. 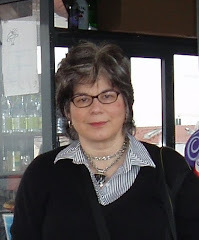 Second back story -- when I returned from Turkey, I needed to create some Passover recipes for my weekly j. column and since I was still enthralled by the dishes I ate in Istanbul, Cappodocia, Esphesus and elsewhere, I decided to recreate some of the food I ate there for Passover. I thought I would try to make a matzo baklava. When I went shopping I saw the very fine, thin Pesach egg noodles and I had one of those recipe creation a-ha moments. What if I used the egg noodles instead of the matzo and made the dish more like the shredded phyllo pastries I saw and ate? 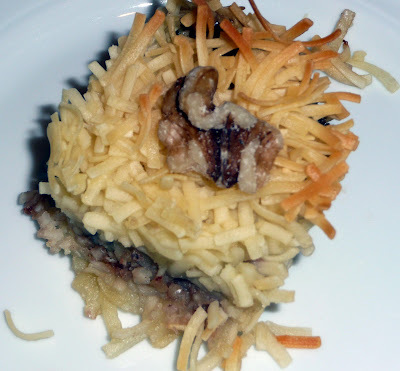 I tinkered a bit in the kitchen crossing some ideas for individual shredded phyllo pastries with some I saw that used the ingredient in more of a pie and came up with this recipe. My testers could not believe it was a Passover dessert. It was a hit. Third back story -- there was no room in the column for this fabulous recipe and it had to be cut. So for the first time anywhere, here is my Passover "Shredded" Pastry recipe. Enjoy. Make sugr syrup by combining water, sugar and lemon juice in a heavy pot over high heat. Stir until mixture boils, then stir occasionally, boiling for about 15-20 minutes until mixture is reduced by half. Let cool then chill. Soak raisins in boiling water to cover until softened, about 20 minutes. Drain and discard water. Grease 8”x8” pan. Preheat oven to 350 degrees. Combine drained raisins, walnuts, cinnamon and sugar in food processor or blender. Chop until coarsely ground. Set aside. Melt margarine or butter. While still warm toss with the fine (thin-style) egg noodles and 1 cup hot water. Press half of the noodle mixture into an even layer in the prepared pan. Top with layer of raisin and walnut mixture. Pat another layer of the noodle mixture evenly on top of the filling. Distribute any extra margarine mixture evenly on top of the final layer of noodles. Cut into 16 squares. Bake for 30-35 minutes until golden and toasty. Immediately pour cold sugar syrup evenly over top. Rest to let pastry absorb the syrup. Top each piece with walnut half. Serve warm or at room temperature. UPDATE: 3/12 -- Several brands of Passover noodles are now gluten free. Look for those and this recipe is appropriate for those on a gluten-free diet. IMPT UPDATE 4.12 -- The gluten-free noodles do not seem to work as well. Suggest using boiling (not hot water) and let soak awhile before using. I couldn't find regular only gluten-free Passover noodles, so I'll have to update and revise recipe completely. FYI - you need 12 ounces of noodles, but the new-style only come in 9 oz. packs.